So here goes the long-awaited post about Maria and Nicholas's fabulous September wedding! 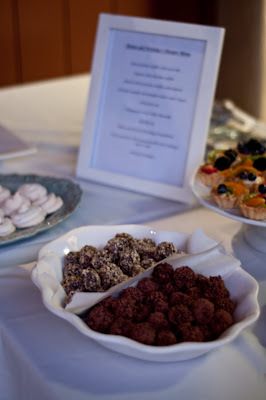 I've already been posting recipes from the various desserts at the wedding for a while now (vegan chocolate pumpkin cupcakes, key lime heart pies, pomegranate-basil-vodka cheesecakes), but I have yet to give you all the big picture, so here goes. This was most definitely my largest order thus far in the history of my little pastry start-up. 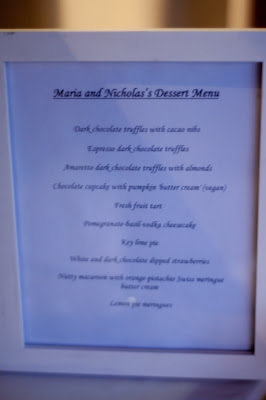 I not only made Maria and Nick's wedding cake, but also a whole dessert bar! We'll get to that, though. First--the cake. Maria is a huge chocoholic, so she most definitely insisted on a chocolate cake, and they wanted cherry, so I decided to make a chocolate cake with dark cherry filling, dark chocolate ganache, and cream cheese frosting on the outside to balance out the darkness inside! (I don't believe in fondant and try to avoid it whenever possible.) 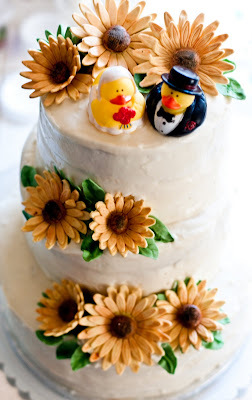 The sunflowers were all made by hand out of sugarpaste. I have to admit, though, as much as I liked the final result with the sunflowers and ducks (Maria and Nick have an awesome rubber duck collection! 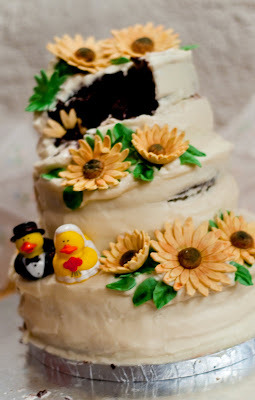 ), the cake looked even better after they had cut into it and taken the first slice. I'm so glad that I was around for it--it makes me feel so special that a couple is eating a cake that *I* made for their special day. 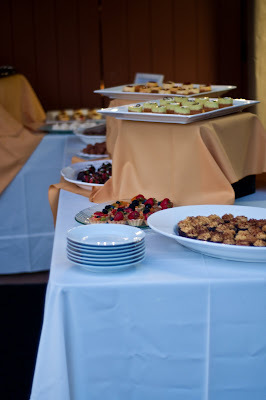 *whew* It was so much fun to do a large mini-pastry order like this, I really have to thank Maria and Nick for the chance! Congrats on your marriage, Maria and Nick!